Rutter, N.w. and Nathan Baker. "Glaciers in Canada". The Canadian Encyclopedia, 07 February 2019, Historica Canada. 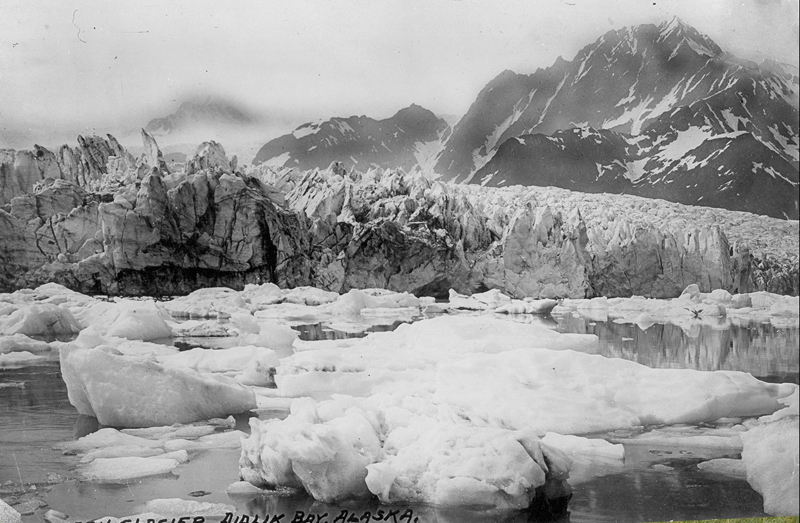 https://www.thecanadianencyclopedia.ca/en/article/glacier. Accessed 18 April 2019. Glacier at Columbia Icefield in Jasper National Park Canada. A glacier is formed by the compaction of snow into ice crystals and commonly also contains air, water and rock debris (Colour Library Books). 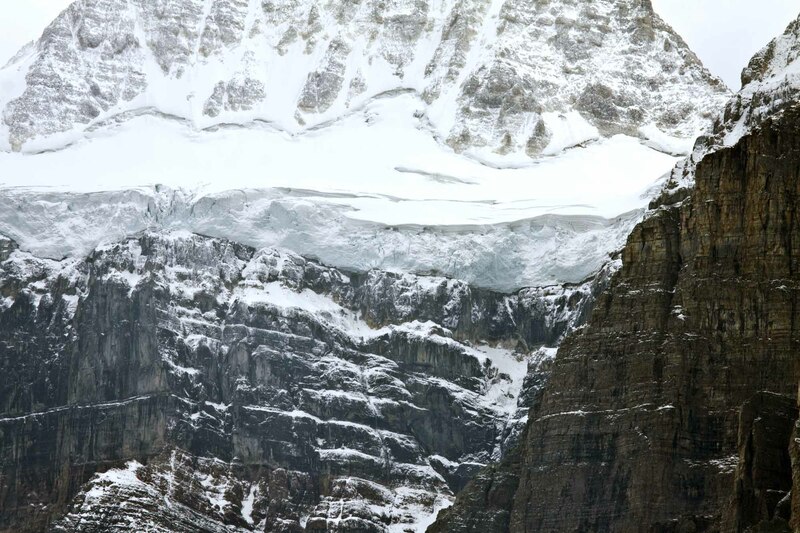 Angel Glacier hangs over a cliff below Mount Edith Cavell in Jasper National Park Canada. Closeup of hanging glacier near Moraine Lake, Banff National Park, Alberta, Canada. Glacier ice moves downslope or outward in all directions under the weight of gravity. 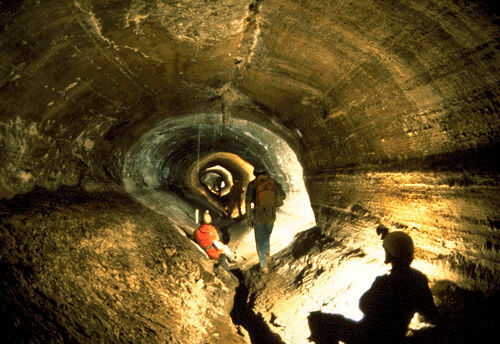 This commonly occurs through internal deformation (structural changes within the glacier) and basal sliding (when the glacier moves on a base layer of meltwater). Glaciers may end on land, in the ocean (as an ice shelf) or in a lake. Their movement, though much slower, is comparable to the flow of a river. There are two principal categories of glaciers: alpine glaciers and continental glaciers. Alpine glaciers form on mountains whose high elevation and cold temperatures allow layers of snow to accumulate and compact into ice. 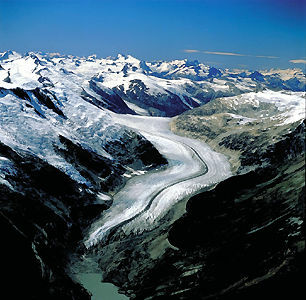 Valley glaciers, whose movement follows underlying slopes, are common examples. 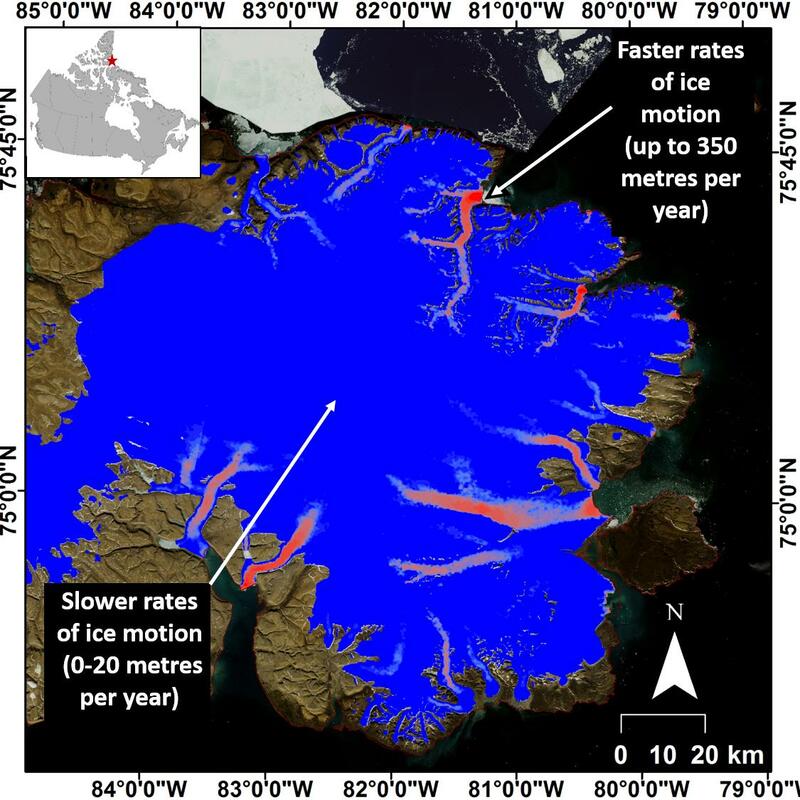 Their speed varies, but most of these glaciers move less than a metre per day on average. 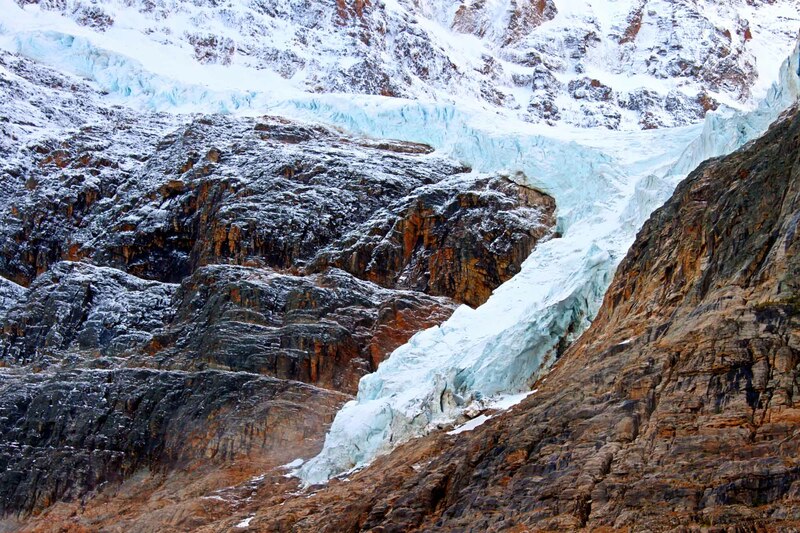 Some valley glaciers, called surging glaciers, can achieve speeds greater than 60 m per day. When a political or societal process takes a very long time, the adjective glacial — a reference to the slow movement of glaciers — is often used to describe its pace. 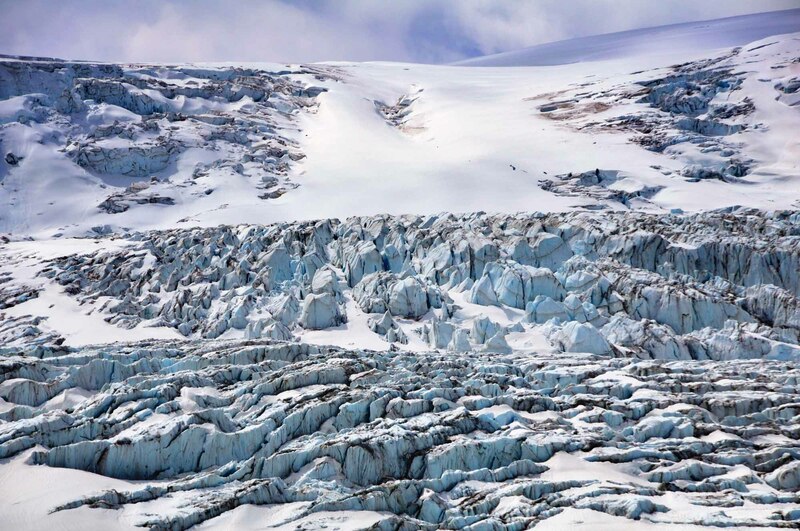 Tens of thousands of valley glaciers exist worldwide. 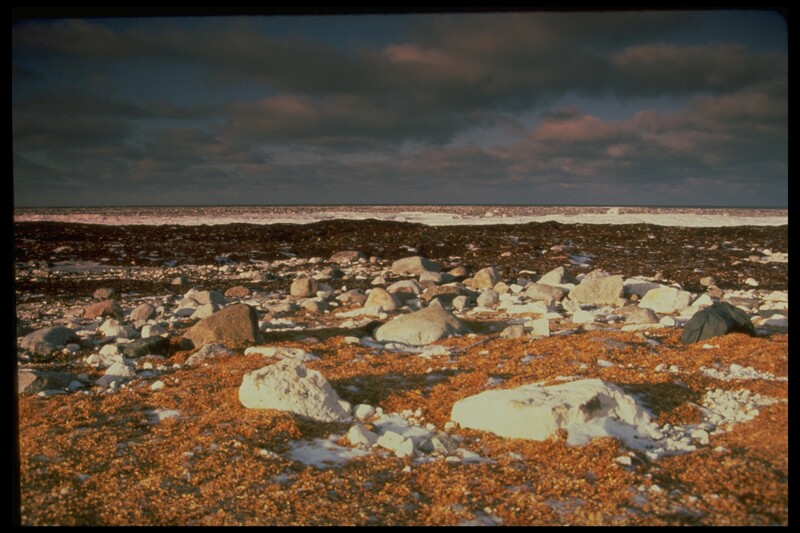 In Canada, they are found mainly at higher elevations of the western mountain systems and in the mountains and highlands of the Arctic Archipelago, e.g., Axel Heiberg, Ellesmere, Devon and Baffin islands. Many are less than one kilometre long. 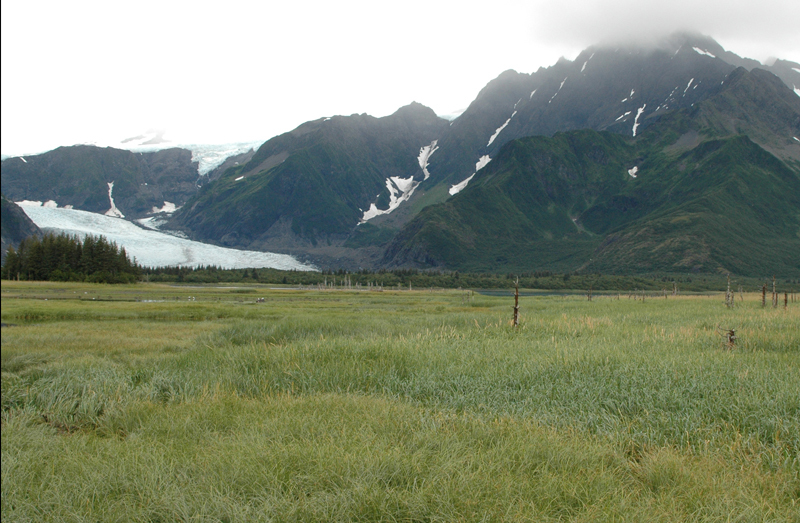 Others are much longer, such as the Hubbard Glacier in Yukon and Alaska, which stretches more than 100 km. Spring sunlight shimmers off of the Belcher Glacier on Devon Island (courtesy Luke Copland, University of Ottawa). Crevasses due to surging on the Upper Hubbard Glacier, St Elias Icefield, Yukon (courtesy Luke Copland, University of Ottawa). Cirque glaciers form in high-elevation depressions at the heads of valleys. 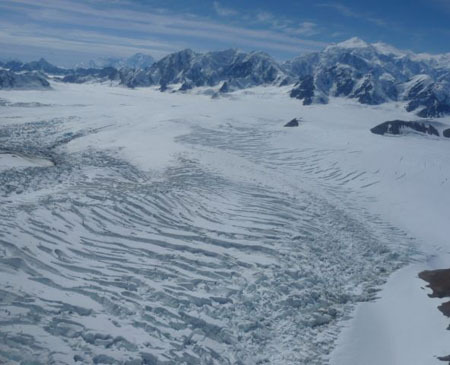 These small glaciers may expand to become valley glaciers. Piedmont glaciers form when ice flows out of valleys and onto flatter land. Thicker than alpine glaciers, continental glaciers cover large areas of Earth’s polar regions. This category contains two types. Glaciers that measure more than 50,000 km2 (e.g., in Greenland and Antarctica) are called ice sheets. 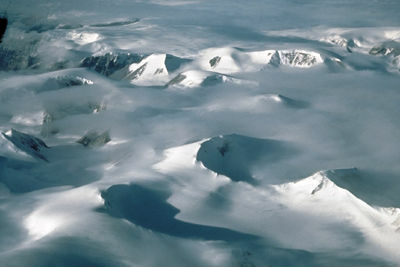 Smaller continental glaciers are called ice caps. Continental glaciers are dome shaped and not greatly impeded by topography; thus, they are able to move outward in all directions. 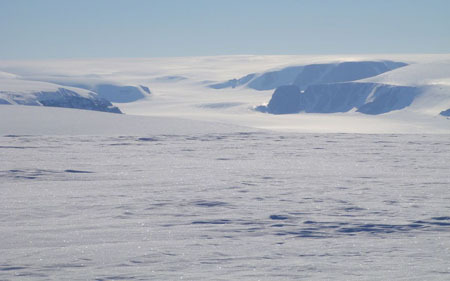 Ice caps and ice sheets generally move at slower speeds than valley glaciers. Canada has several ice caps, located in the Cordillera and Arctic Archipelago. 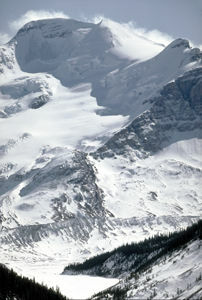 Features commonly produced by glaciers can be observed on or near the Athabasca Glacier in the Rocky Mountains of Jasper National Park. 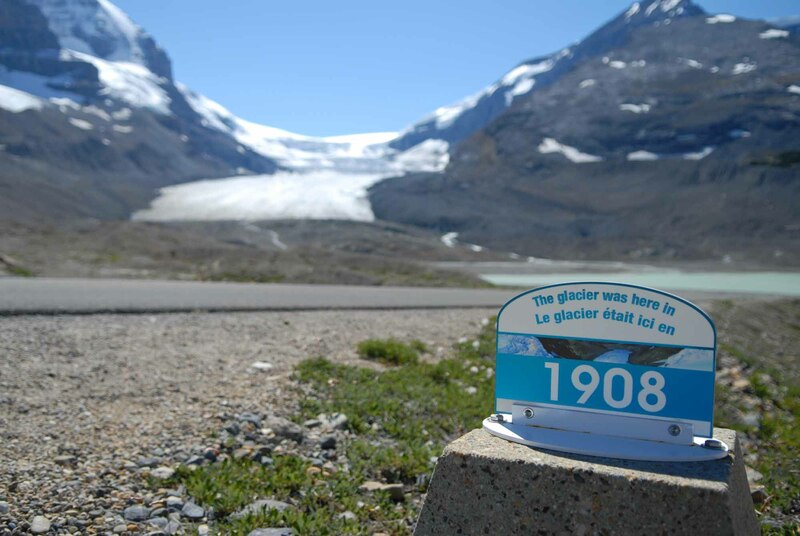 This glacier, fed by the Columbia Icefield, has been shrinking (or “retreating”) since the mid-1800s. 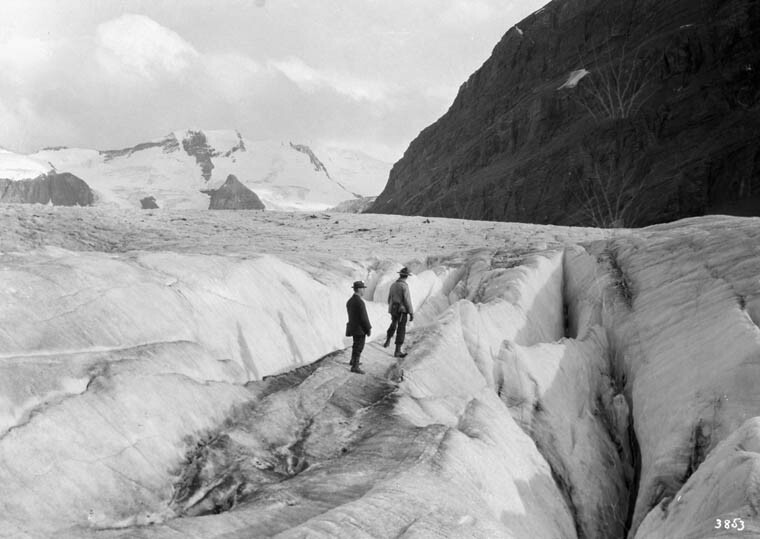 Its surface exhibits crevasses, i.e., cracks that form when the glacier is stretched by accelerated movement or when it travels over uneven rock. Icefalls — steep, unstable masses of ice blocks — have resulted from crevasses formed where the glacier hangs over a sharp formation of bedrock such as a cliff. The Athabasca Glacier is formed from the ice fall coming from the Columbia Ice Field. The glacier is said to be 800 feet deep. Athabasca glacier from Wilcox Pass. 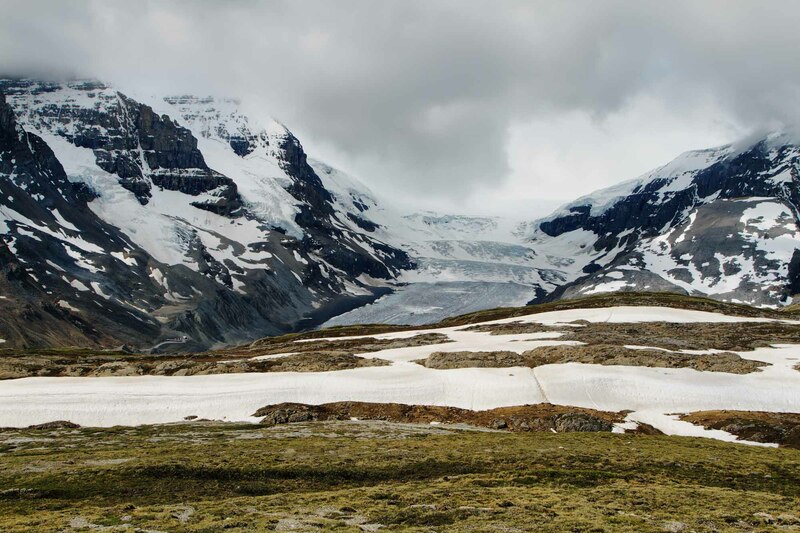 Columbia Icefield (courtesy Canadian Tourism Commission & Ocean Images). 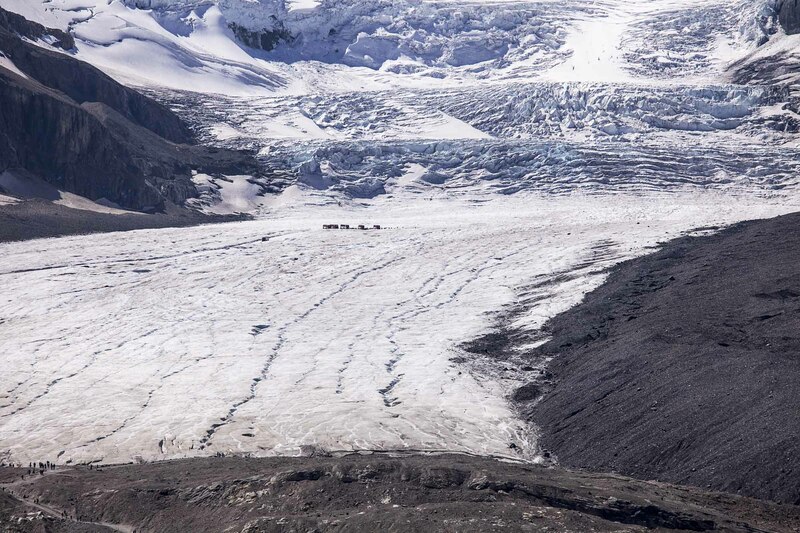 Other features that were formed during the retreat of the Athabasca Glacier (and can be seen nearby) include lateral and recessional moraines — masses of debris deposited along the end or “toe” of the glacier. 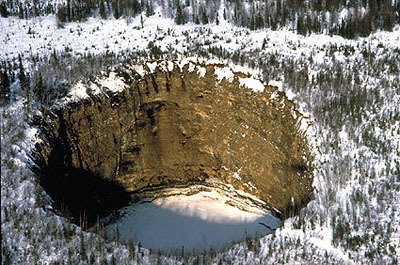 In addition, glacier meltwater carries and deposits debris, forming such features as deltas and glacial outwash plains composed of sand and gravel (see also Esker). It takes 150–200 years for snow on the Athabasca Glacier to turn to ice, travel the glacier’s 6 km length and melt at its toe. This is considered a short journey relative to larger, slower glaciers. Location and date marker for glacier movement in Jasper National Park. Global average temperatures have increased at an unprecedented rate over the past two centuries due to the effects of human activity on climate change. With warmer temperatures and decreased snowfall, many glaciers have been melting faster than ice can accumulate. Sea levels are projected to rise as this process continues, affecting millions of people living along coastlines and in island nations worldwide. 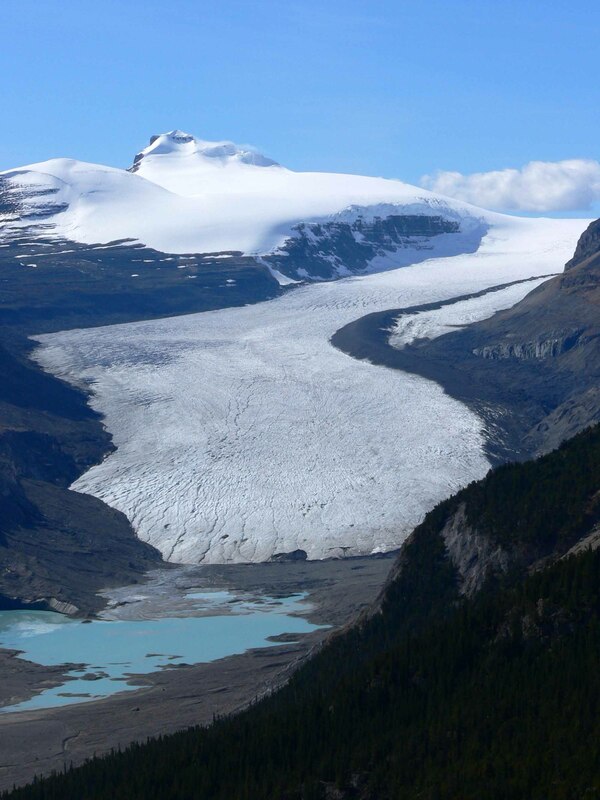 A 2015 study affiliated with the University of British Columbia projected that by the year 2100, glaciers in Alberta and BC could lose 70 per cent of their 2005 volume. These glaciers have been thinning at a rate of about one metre per year, and their peak volume loss is expected to occur between 2020 and 2040. With more than 17,000 glaciers, Alberta and BC would experience dramatic changes to their ecosystems, water supply, agriculture and tourism. 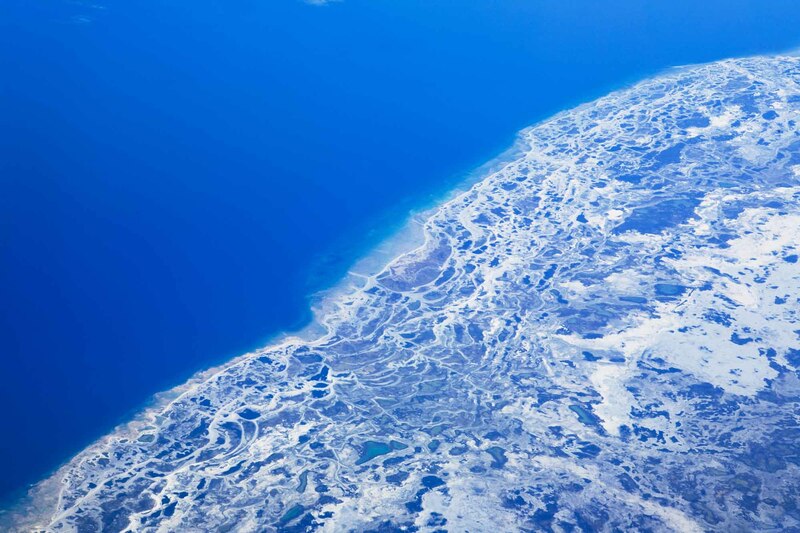 An aerial view of a melting glacier in the ocean. See also Glaciation; Iceberg; Cold Places in Canada. Chris Yorath and Ben Gadd, Of Rocks, Mountains and Jasper: A Visitor’s Guide to the Geology of Jasper National Park (1995). Garry K. C. Clarke et al., “Projected deglaciation of western Canada in the twenty-first century,” Nature Geoscience8,372–377 (2015). Peter G. Knight, Glaciers (1999). Natural Resources CanadaMore information on glaciers from the Canadian government department that studies them. Vancouver SunAn article about research led by UBC's Garry Clark on glacial melt in Western Canada due to climate change. Athabasca Glacier and Columbia Icefield GeoVistas BrochureAn informational brochure published by the Canadian Federation of Earth Sciences in 2011.